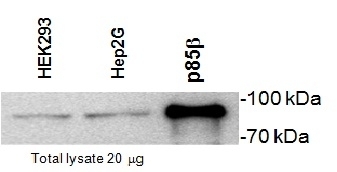 Mouse anti PI-3 Kinase p85 Subunit beta antibody, clone T15 recognizes the p85 subunit of bovine PI-3 kinase. Brehme,M. et al (2009) Charting the molecular network of the drug target Bcr-Abl. Hale, B.G. et al. (2008) Binding of influenza A virus NS1 protein to the inter-SH2 domain of p85 suggests a novel mechanism for phosphoinositide 3-kinase activation. J Biol Chem. 283: 1372-80. Ehrhardt, C. et al. (2007) Influenza A virus NS1 protein activates the PI3K/Akt pathway to mediate antiapoptotic signaling responses. Massone, C. et al. (2011) Immunophenotype of skin lymphocytic infiltrate in patients co-infected with Mycobacterium leprae and human immunodeficiency virus: a scenario dependent on CD8+ and/or CD20+ cells. Br J Dermatol. 165: 321-8. Yokoyama, K. et al. (2011) NYAP: a phosphoprotein family that links PI3K to WAVE1 signalling in neurons. Ylösmäki, L. et al. (2015) Reorganization of the host cell Crk(L)-PI3 kinase signaling complex by the influenza A virus NS1 protein.